The research team of Nagoya University, Nagoya Institute of Technology, the Institute of Medical Science in Tokyo University, and the Nikon Corporation has developed intelligent software to replace the human checking procedures in regenerative medicine cell culture processes. Team leader, Dr. Ryuji Kato, associate professor in the Graduate School of Pharmaceutical Sciences, Nagoya University, says that this technology enables us to evaluate, or even predict, cellular qualities, which could previously only be accomplished by classic destructive methods in cell research. Since their software algorithm uses only microscopic images to quantitatively evaluate the quality of cells, this technology enables us to lessen the heavy workload of medical staff and culture experts, and to drastically cut the cost of cellular production of cells in medical facilities that offer cell therapy using recent technology in regenerative medicine. Prof. Kato continues, stating that this technology also helps introduce "automatic decision making system" in the robotic automation systems of cell culturing, which are being developed rapidly by machinery companies. Their achievements, supported by funding from the New Energy and Industrial Technology Development Organization (NEDO) were reported in the scientific journal PLoS One in March 2013, and also in a press release by NEDO. In recent cell culture technologies, in order to gain a sufficient number of cells with which to treat defects in regenerative medicine, a limited number of the patient's cells must be multiplied outside the body. During such long-term "artificial" culturing of cells, the activities of cells can be enhanced for greater medical effect. However, it is known that it is difficult to precisely control such cellular activity changes using classical cell research techniques. The greatest dilemma in regenerative medicine has been that, although many highly reliable cell evaluation techniques which previously supported all the cell sciences exist, they cannot be easily used on cells intended for cell therapy, as they "damage" the cells to be used afterwards for therapy. Therefore, the present quality control method for checking cellular status had been limited to the most basic method: manual microscopic observation by culture experts. Such reliance on manual checks has been the critical bottle-neck in the industrialization of regenerative medicine, because manual efforts are "laborious" and "not quantitative". To reduce the onerous tasks that are pushing up the cost of regenerative therapies, machinery companies are devoting much effort to automating the manual procedures. However, "intelligence programming" with which to regulate the robots had not been developed to any extent. Prof. Kato assigned cell culture experts, biologists, medical doctors, statisticians, and industry engineers to a team, to make technological cross-overs through collaboration. 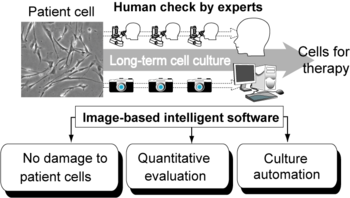 In order to design the intelligent software necessary for replacing the cell culture experts' "manual check", they first examined how those experts judge cells in images, and developed a cell recognition program to computationally "recognize" cells in the non-stained grey-color images. Secondly, they examined how experts link the visual image with their experimental memory, and developed a "decision-making program" to judge the success of cell culture by the "faces of cells". 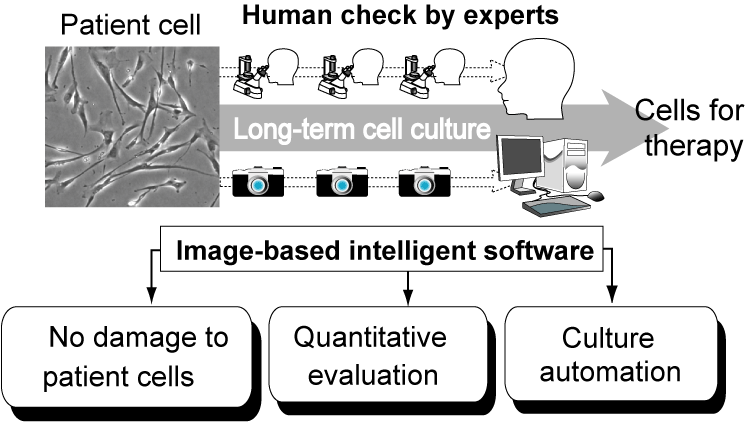 They found that their developed software can predict the results of cell qualities measured utilizing previous methods with high accuracy, using only a few images. Such predictive performance indicates that "the optimum timing for cell therapy" can be chosen by using the software's cell quality prediction, just as we use the weather forecast for choosing the best day for a date. >Prof. Kato's group now aims to develop image analysis software combined with commercial automatic cell culture systems to develop the economic advantages in the field of regenerative medicine. They believe that their intelligent software-based cell quality checking system will be able to stabilize the cell culture production processes in medical facilities, and improve both the safety and efficacy of cell therapies. 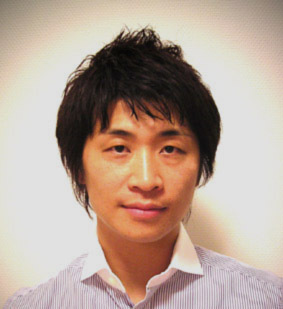 Associate Professor Ryuji Kato is a front-line researcher in the application of biological information obtained from human cells and bio-functional molecules to drug screening and regenerative medicine. His research is not limited to the realm of medical and pharmaceutical sciences; he has also promoted cooperation between medical sciences and engineering technology developments, and industry-university joint research projects. "Drug development and regenerative medicine will play important roles in our scociety rushing into the situation of decreasing birthrate and aging population. It would be my pleasure and life-work to devote myself in the technology development to "bring the ideas in real", to share the recent advances of sciences with our scociety." "Who you meet, would be the treasure and guidance of life. Because I now feel that such human linkages are the most powerful energy to make challenges. Especially to be a researcher, an encounter with a mentor definitely and surprisingly changes your research life. It's never too late than never. If your heart is touched by someone, please stand up and go to meet the person. That small courage will change everything."